With Philip Rivers turning 37 in December it’s time for the Los Angeles Chargers to start pondering the possibility of drafting his successor. 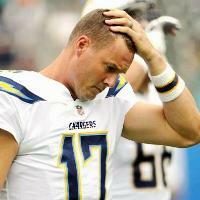 The Chargers have a team full of so much youth with players such as wide receiver Keenan Allen, running back Melvin Gordon, Hunter Henry at tight end, yet at the quarterback position, they lack a player capable of taking over after Rivers retires. At some point they have to get ready for life after Rivers to avoid spending years trying to find their quarterback of the future and this year’s draft could be a good moment to do so. Although they pick 17th and won’t get access to top-rated quarterbacks such as Sam Darnold, Josh Rosen, and Josh Allen, they may have the opportunity to draft Baker Mayfield or Lamar Jackson. Although Mayfield has a lot of upside to his game he could slide down the draft’s first round because a lot of teams are concerned about his off-the-field incidents. If that happens he would be a steal for a team like the Chargers. The Chargers need to solidify that position as soon as possible and they know it. That’s why they will evaluate the possibility of drafting a quarterback in the first round. Even though they are happy with him and his level of play they know that Rivers is not going to be around forever and thus should be ready in case he suffers a long-term injury. The teams in the Chargers division are already looking to the future as they’ve all moved on to younger quarterbacks. Derek Carr is a rising star in Oakland, Kansas City handed the offense to Patrick Mahomes and Denver hopes to find their next quarterback at this year’s draft, so if the Chargers want to be able to compete in tomorrow’s AFC West they need to get Rivers’ replacement sooner rather than later. You’re wrong. At #7 there will ONLY BE ONE of the top 4 QBs left and with the Bucs primed to trade down, ANY TEAM that wants that last of the top 4 QBs is going to have to trade up to #7 to get him, not #8, #9 or #10. If the Bills would rather have Lamar Jackson or Mason Rudolph than one of the top 4, we can trade with the Bengals, Cardinals, Dolphins, Ravens or Chargers. The thing is I HIGHLY DOUBT the Bills like either Jackson (Tyrod 2.0) or Rudolph (a nobody compared to the big 4) better than any of the big 4 guys. So, again, I think you are 100% wrong. I have little doubt that ONLY ONE of the big 4 QB prospects will be available when the #7 pick rolls around so any team that wants him will need to deal with the Bucs to guarantee they get him.